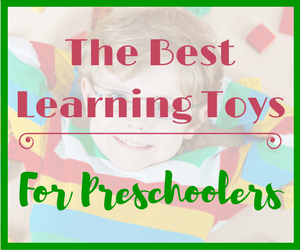 Seeme & Liz > Play Based Learning Articles (2-4 year olds) > Must Try Outdoor Activities For Preschoolers! 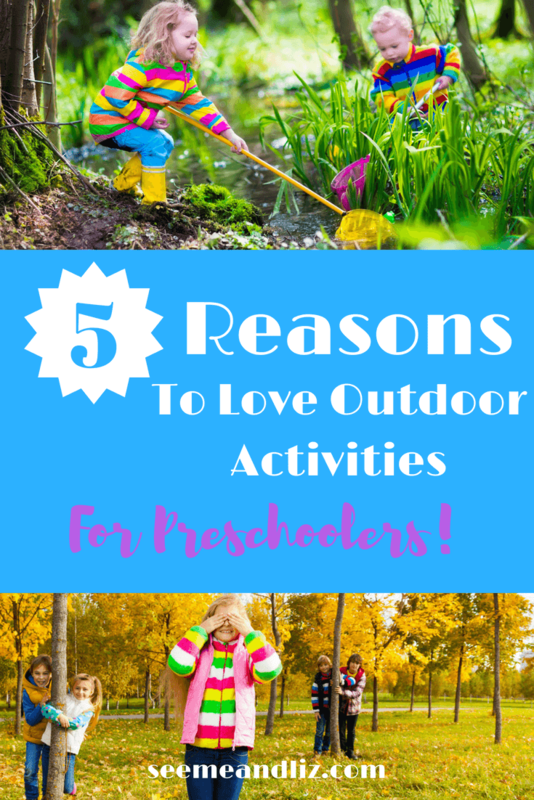 Outdoor activities for preschoolers should not be taken for granted. In fact, children are spending less time outdoors than ever before and this is impacting their development. 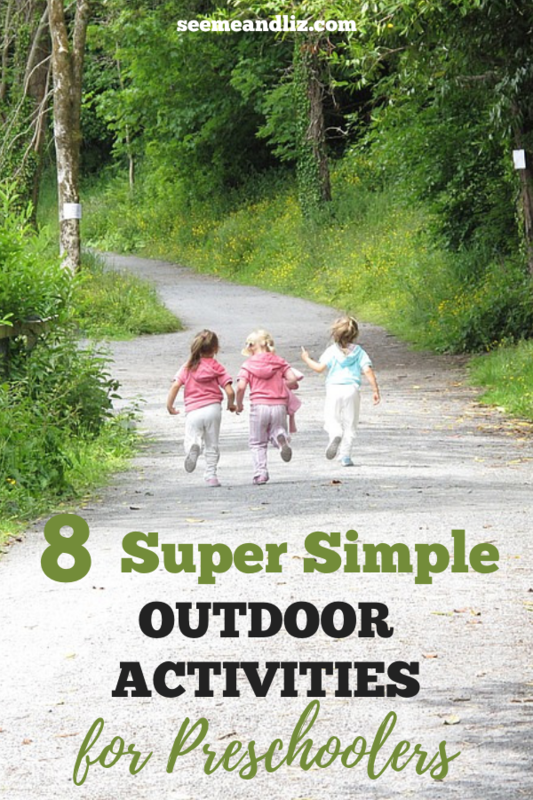 So here are 5 great reasons to get your kids outside! 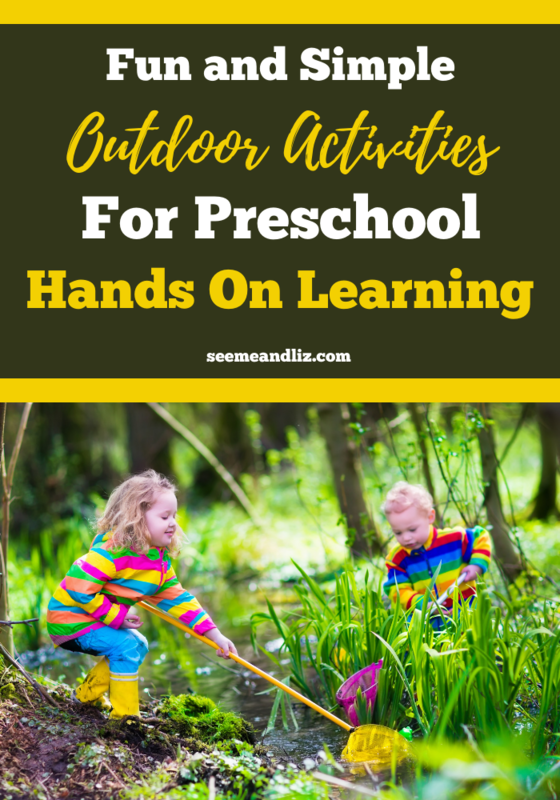 Plus, read to the end to learn about some of my favorite activities that can be done outside (and they are simple, nothing too complicated). 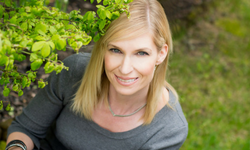 I will explain how skills can naturally be strengthened during these activities! Children are spending less time outside than ever before. But outdoor play is so important to a child’s development, so it shouldn’t brushed aside as a waste of time. If your child is like most, they are drawn to what show is on TV or what game they can play on the iPad, Wii, Xbox, etc. With screens, the rewards are instant. Even adults have a hard time stepping away from their screens. So encouraging your child to play outside gives them a much needed break from screen time and the urge for instant gratification. Playing outside and getting dirty boosts immunity! Playing outside (without any rules or structure) is true learning through play! Your child will burn calories while playing. Running, jumping, digging, picking, etc. 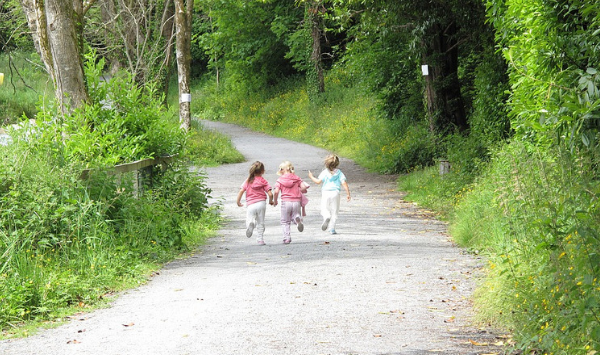 outside helps with fine and gross motor development as well as speech-language development. So, it is up to you, the parent to encourage plenty of play time outside of the house. Make sure that some of that time is unstructured play where your child decides what she wants to do. If you hear “I’m bored” or “I want to go inside”, below are a few games and activities you can suggest. Get your child to wash his bike, wagon, etc. My kids love doing this and can spend quite some time at it. Talk about whether or not the water should be cold, warm or hot. But remember to let your child play and have fun, the interactions should be natural. If your child has siblings or if some friends are over, sit back and watch how they play together during this activity. My daughter invented this fun activity when she was about 8 years old. It combines being an archaeologist with a scientist. First find a pile of dirt your child can play around in. Next, have him scoop some into a sieve to see if there are any “treasures” (my daughter found a small colorful pebble to add to her collection). After that fill soil, sand, pebbles, mulch into separate containers or test tubes. Then add a bit of water. See which containers have items that float or sink. 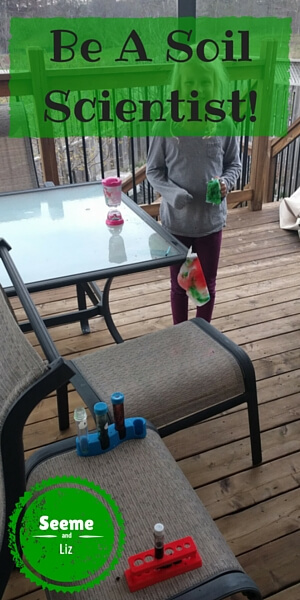 My daughter also decided to add some food coloring to the containers to see if she could dye the soil, sand and pebbles. This may be an activity you have already tried with your kids. But if you haven’t I guarantee you children will want to do it over and over again, despite it being such a simple activity. Fill some baking soda into a cup (a few tablespoons is enough). If you want a colorful explosion add a few drops of food coloring. Then pour in some vinegar and watch it start foaming and spilling over the cup! My kids have done this hundreds of times and it just does not get boring. They now do this independently! A larger yogurt or sour cream container will work best. In order to see into the container once the lid is on, it is best if you cut a large hole in the lid. Then cover the lid with cling wrap and secure with tape. Finally poke some holes into the cling wrap. Now you can go exploring for some bugs, frogs, caterpillars or worms. Talk about what these creatures might want in their home to make it more comfortable (e.g. grass, twigs, pebbles, etc.). My kids caught a caterpillar in one of their bug catchers and we had no idea what they ate or drank, so we went to google to look it up. Did you know that they get their liquid from water that is in leaves and plants? Many play tents fold into a bag and when you take them out they pop up, making the set-up process very easy. 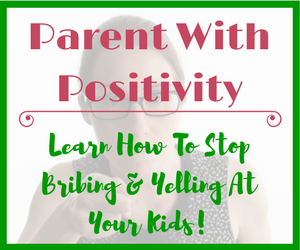 So easy in fact that your child can probably do it with little to no help. Getting it back in the carrying bag is another story though. There are options that come with poles, more like a traditional tent, however set-up is still quite simple. Encourage your preschooler to think about things he might like to take on his camping trip. Or just let him play with some friends and while you are a quiet observer. Your child may surprise you with his creativity. My children love playing with their pop up tent. They have pretended it’s a car, turned it into a ball pit, an airplane and a wrestling ring! You can even get a space themed tent and tunnel set so it could become a rocket ship that takes the camping trip to an undiscovered planet! If the weather isn’t cooperating, give indoor camping a try! Bubbles are one of my favorite outdoor activities and kids never seem to get bored of it. My kids are 6 (almost 7) and 8 and they still love bubbles. Blowing bubbles gets kids running around and moving. If your child is young (1-2 years old) or has a speech-language delay, check out Some Facts About Blowing Bubbles With Kids That Will Impress! for some language development tips! Supplies Needed: spray bottles or plastic containers filled with water, paint brushes, fence or wall. If you don’t mind a bit of a mess, add a small amount of washable paint to the water for some color. Get the children painting the side of the house or an old fence! This may seem like a boring activity to adults, but kids love it and can spend a great deal of time “painting”. They can either spray the “paint” on with a spray bottle or use a brush, or try both. If you add a bit of washable watercolor paint, they will get to see some color once their work of art dries. Take a hose to it or wait for a good rainfall and it should all wash away! Any kind of water activity is fun and packed with learning opportunities for preschoolers! 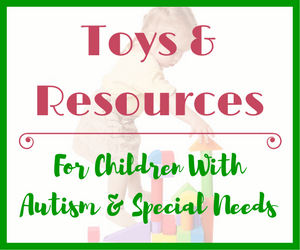 Get all the necessary supplies with your child. Ask her what she thinks is needed for a fun picnic. Let her help you with the food prep as much as possible. My children regularly have “picnics”. Often it simply involves them getting a bowl of goldfish crackers, some grapes and a glass of water. It doesn’t have to be extravagant to be exciting in a child’s eyes! Getting The Kids Outside Shouldn’t Be Negotiable! I could probably come up with a list of over 100 fun outdoor activities, but you get the idea from these 8 that it doesn’t need to be anything complicated. Children find fun in some of the simplest activities. And remember, just because it may seem boring or pointless to an adult, your child is learning! 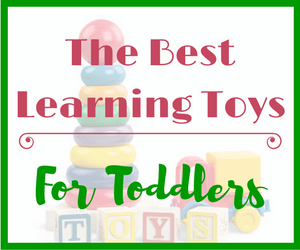 If they are playing, they will learn something new or they get to practice existing skills. 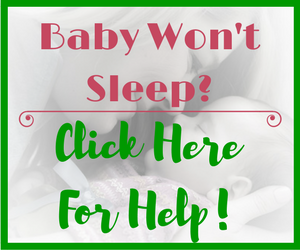 Getting your child(ren) outside is just as important as eating healthy and getting a good night sleep! If the weather isn’t cooperating, check out these fun indoor activities! And if you want even more suggestions, here are 111 Awesome Ideas For What To Do When The Kids Are Bored! What are some of your favorite outdoor activities for preschoolers? “Getting dirty,” is highly underrated, and you are spot on with that suggestion. Exposure to microbes is what fine-tunes our immune system, trains it to react to what are genuine threats without overreacting to what are not, the latter being the source of many autoimmune diseases. Besides, kids love getting dirty. By all means let them! To that end, “soil scientist” is a great way to do it, nice idea! Thanks Jon! Speaking of kids needing to get dirty and be exposed to germs, have you read the latest research about the lack of bacteria exposure in young children and leukemia? Here is some information about that I found very interesting. I get outside with my toddler everyday. I think it is so important-not only for kids but for adults too! This feels harder to do in the winter months, but I still think it should be done. I love your idea with the baking soda, food dye and vinegar. I am going to try that activity with my 1.5 year old tomorrow. She will love it! Great post and thanks for the ideas. Thanks Liz! It definitely is important for adults to get outside as well. We are becoming quite sedentary these days and well all need exercise. Your daughter will be fascinated with the volcano activity! My kids are 6 and 8 and this “experiment” never seems to get old. Because they are more indendent now they can do this all on their own. Oh wow I loved those activities when I was a kid. I think generally that kids love activities that challenge them a little yet at the same time being fun. Take your washing bike for example, it really makes kids enjoy the sense of accomplishment to see their bike turn sparkling clean. I think camping is awesome too. If you have a giant backyard, it’s even easier. What about sports? Do you recommend sporting with the little ones? Yes, washing bikes is an extremely fun activity. My kids also love pretending to paint their bikes with water. They have set up an entire car shop where one of them is the customer and the other works at the shop. It’s so wonderful to see the imaginative things they come up with. Sports are also great. I am not a big fan of young kids being involved in too many organized sports though. Yes, it gets them outside and active (assuming it’s an outdoor sport) but these don’t inspire creativity. Organized sports teach children the importance about being a team player and following a set of rules, which is good. It’s all about finding a happy medium.